BORROUGHS CAN SUPPLY all your workbench needs with a wide range of heavy-duty equipment for your service department and maintenance areas. 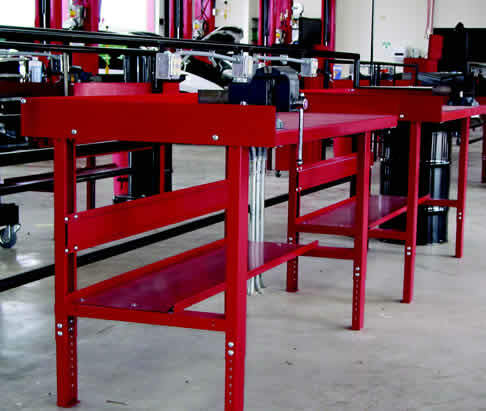 With over 200 sizes and styles of shop equipment and tech benches available, Borroughs knows how important it is for your service department to be quick and efficient. Let our tech benches and storage units help improve your productivity. No exposed hardware on front, top or back. 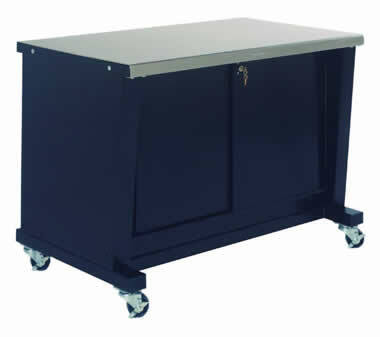 Heavy-duty (12 ga.) steel legs and work surface. Optional work surfaces available (stainless shown). 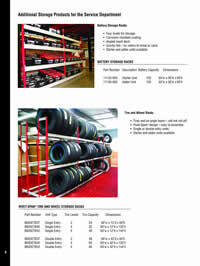 Available in widths of 48", 60" and 72". Adjustable center shelf holds up to 500 lbs. Sliding doors with key lock standard. Full-length top and bottom door tracks. *Shown with optional 6" high welded caster base. 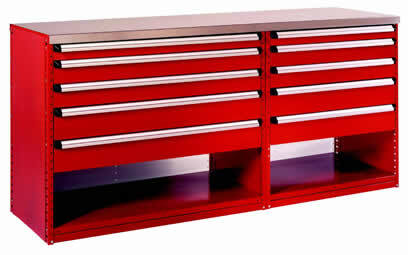 All 200, 300 and 350 Series workbenches include a painted steel top. To order an optional top, add the proper suffix to the catalog number. 11 gauge welded steel tube construction. 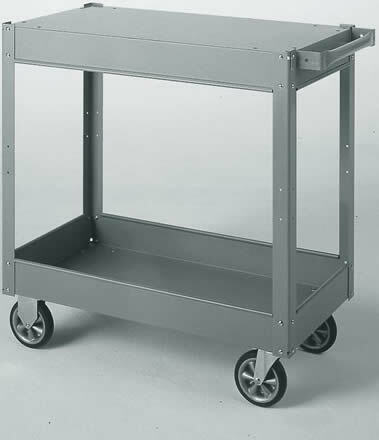 Sturdy, wide-profile casters rated for 600 lb. capacity. Designed with 28" high doors to allow for cleaning under unit. 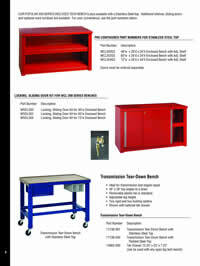 DRESS UP YOUR PARTS AND SERVICE AREAS with stain­less steel tops. 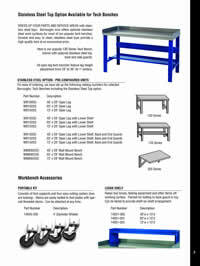 Borroughs now offers optional stainless steel work surfaces for most of our popular tech benches. Durable and easy to clean, stainless steel tops provide a high quality look at an economical price. 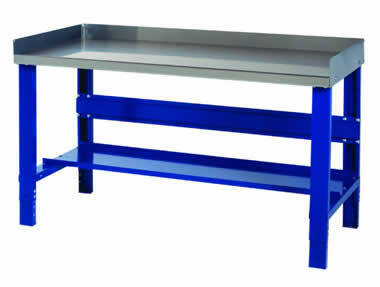 Here is our popular 130 Series Tech Bench, shown with optional stainless steel top, back and side guards. 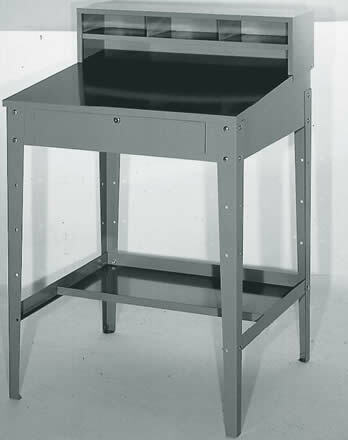 All open leg tech benches feature leg height adjustment from 28" to 36" on 1" centers. 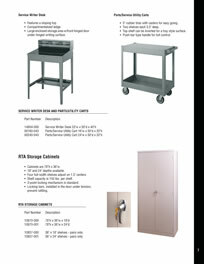 Borroughs' Tech Benches including the Stainless Steel Top option. 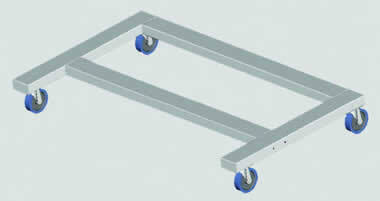 Consists of foot supports and four easy-rolling casters (two are locking). 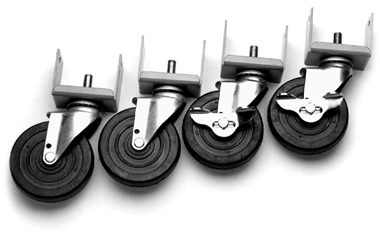 Stems are easily bolted to foot plates with spe­cial threaded stems. Can be attached at any time. Keeps tool boxes, testing equipment and other items off working surface. Pierced for bolting to back guard or top. 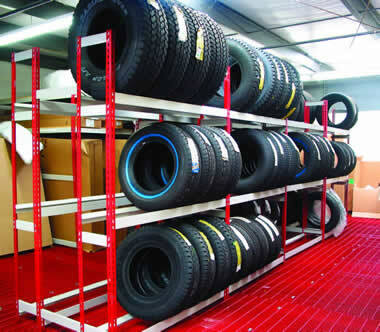 Can be tiered to provide shelf-on-shelf arrangement. 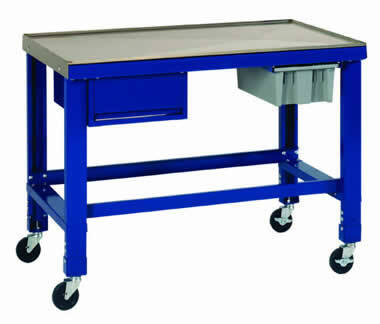 OUR POPULAR 300 SERIES ENCLOSED TECH BENCH is also available with a Stainless Steel top. 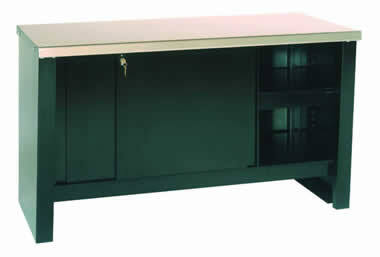 Additional shelves, sliding doors and optional work surfaces are available. For your convenience, use the part numbers below. Doors must be ordered separately. Ideal for transmission and engine repair. 48" x 28" top angles to a drain. Removable plastic bin is standard. Two rigid and two locking casters. Shown with optional tier drawer. 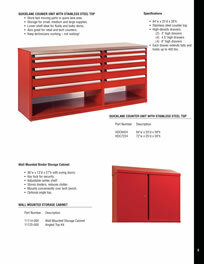 Tier Drawer 15.25" x 20" x 7.25"
Store fast moving parts in quick lane area. 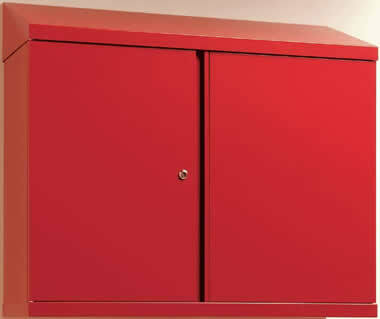 Storage for small, medium and large supplies. Lower shelf ideal for fluids and bulky items. Also great for retail and tech counters. Keep technicians working – not waiting! 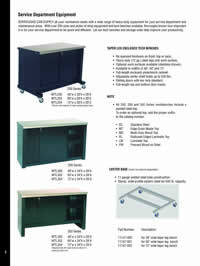 84"w x 25"d x 39"h.
Each drawer extends fully and holds up to 400 lbs. 36"w x 13"d x 27"h with swing doors. Mounts conveniently over tech bench. Tires rest on angle beam – will not roll off. Rivet-Span design – easy to assemble. Single or double entry units. Starter and adder units available. 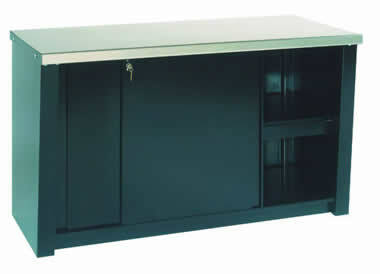 Large enclosed storage area w/front hinged door under hinged writing surface. 5" rubber tires with casters for easy going. Two shelves each 3.5" deep. 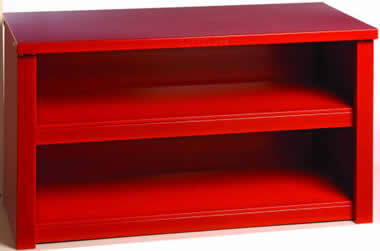 Top shelf can be inverted for a tray style surface. Push-bar type handle for full control. 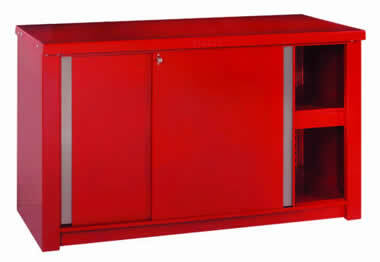 Cabinets are 78"h x 36"w.
18" and 24" depths available. Shelf capacity is 150 lbs. per shelf. 3-point locking mechanism is standard. Locking bars, installed in the door under tension, prevent rattling. Borroughs distributors are thoroughly trained and knowledgeable concerning the specialized requirements of automobile dealerships. 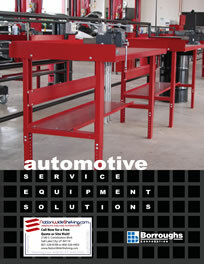 We understand how important the parts and service departments are to the profitability of the dealership. 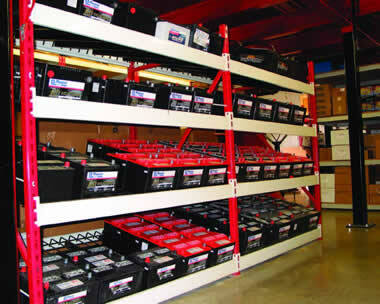 Our high quality, durable products will provide years of reliable performance. 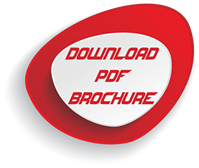 Let Borroughs show you how to increase productivity and customer satisfaction. 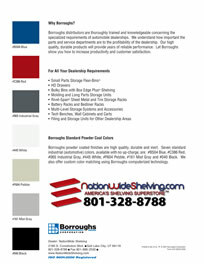 Borroughs powder coated finishes are high quality, durable and inert. Seven standard industrial (automotive) colors, available with no up-charge, are: #B504 Blue, #C386 Red, #065 Industrial Gray, #445 White, #F604 Pebble, #161 Mist Gray and #040 Black. We also offer custom color matching using Borroughs computerized technology.